RIYADH (Reuters) - Saudi Arabia's new King Salman pledged continuity in energy and foreign policies on Friday and moved quickly to appoint younger men as his heirs, settling the succession for years to come by naming a deputy crown prince from his dynasty's next generation. 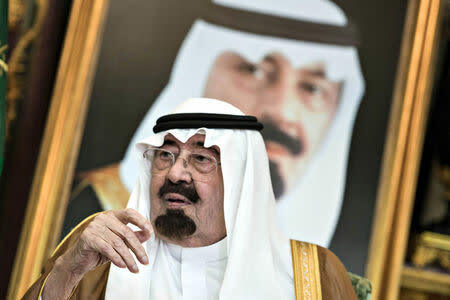 King Abdullah, who died early on Friday after a short illness, was buried in an unmarked grave in keeping with local religious traditions. By appointing his youngest half-brother Muqrin, 69, as Crown Prince and nephew Mohammed bin Nayef, 55, as Deputy Crown Prince, Salman has swiftly quelled speculation about internal palace rifts at a moment of regional turmoil. 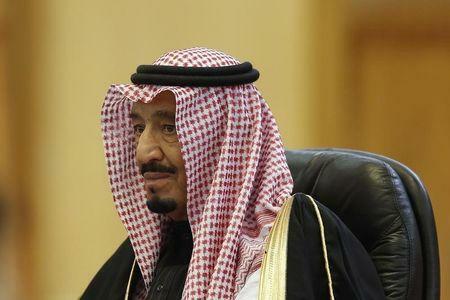 Salman, thought to be 79, takes over as the ultimate authority in a country that faces long-term domestic challenges compounded by the plunging price of oil in recent months and the rise of the Islamic State militant group in Iraq and Syria, which vows to toppled the Al Saud ruling family. Salman must navigate an intense rivalry with Shi'ite Muslim power Iran playing out in Iraq, Syria, Yemen, Lebanon and Bahrain, open conflict in two neighboring states, a threat from Islamist militants and bumpy relations with the United States. In his first speech as king, shown live on Saudi television, Salman pledged to maintain the same approach to ruling the world's top oil exporter and birthplace of Islam as his predecessors and called for unity among Arab states. "We will continue, God willing, to hold the straight course that this country has followed since its establishment by the late King Abdulaziz," he said. Salman becomes the last Saudi ruler to be born before the discovery of commercial quantities of oil in the world's top crude exporter. And Mohammed bin Nayef becomes the first grandson of the kingdom's founding monarch, King Abdulaziz, known as Ibn Saud, to take an established place in the line of succession. All Saudi kings since Abdulaziz's death in 1953 have been his sons and the need to move to the next generation had earlier raised the prospect of a palace power struggle. King Salman also appointed his own son, Mohammed bin Salman, Defense Minister and head of the royal court. The rapidity of the decisions startled Saudis, used to a delay of up to several months before top appointments following the deaths of their monarchs. The choice of Mohammed bin Nayef was seen by some as a reflection of his strong record in counter-terrorism in his role as interior minister. "Times are dangerous," said Joseph Kechichian, a scholar of Gulf Arab ruling families. "Mohammed bin Nayef's appointment shows Salman feels it's important to speak quickly with a single determined voice in the face of all these threats." U.S. President Barack Obama, moving to cement Washington's long alliance with Saudi Arabia, was expected to speak to Salman in the coming days. Reputedly pragmatic and adept at managing the delicate balance of clerical, tribal, royal and Western interests that factor into Saudi policy making, Salman appears unlikely to change the kingdom's approach to foreign affairs or energy sales. Despite rumors about Salman's health and strength, diplomats who have attended meetings between the new king and foreign leaders over the past year have said he has been fully engaged in talks lasting several hours at a time. His nominated successor, Crown Prince Muqrin, is a former fighter pilot and a relative progressive who grasps the need for long-term reform, but who also has traditionally hawkish views on Iran. In a country with a young population, many Saudis will be unable to recall a time before King Abdullah's rule, both as monarch from 2005 and as de facto regent for a decade before that. His legacy was an effort to overhaul the kingdom's economic and social systems to address a looming demographic crisis by creating private sector jobs and making young Saudis better prepared to take them. "I think (Salman) will continue with Abdullah's reforms. He realizes the importance of this. He's not conservative in person, but he values the opinion of the conservative constituency of the country," said Jamal Khashoggi, head of a news channel owned by a Saudi prince. However, Abdullah's reforms did not stretch to politics, and after the Arab Spring his security forces clamped down on all forms of dissent, imprisoning outspoken critics of the ruling family alongside women drivers and Islamist militants. As the Saudi population grows and oil prices fall globally, the royal family will increasingly struggle to maintain its generous spending on social benefits for ordinary people, potentially undermining its future legitimacy in a country where there are no elections, analysts say. King Salman has previously spoken against the idea of introducing democracy in Saudi Arabia in comments to American diplomats recorded in embassy cables later released by WikiLeaks. He is expected to focus on creating jobs and big infrastructure projects to prevent falling oil prices from causing social tensions or undermining business confidence. In keeping with Muslim traditions, Abdullah's body, clothed in white and shrouded in a plain cloth, was carried on a stretcher by relatives to rest in a mosque before being taken to a cemetery and buried in an unmarked grave. Prayers in the mosque were led by King Salman and attended by Muslim heads of state and other senior figures. Among those who went to Riyadh were Turkish President Tayyip Erdogan, Egyptian Prime Minister Ibrahim Mehleb and Qatar's emir Sheikh Tamim bin Hamad al-Thani. Iranian media said Foreign Minister Mohammad Javad Zarif would also attend. Non-Muslim dignitaries will visit to pay respects to the new monarch and crown prince, and other members of the Al Saud dynasty, in the coming days. Later, following the evening prayer an hour after sunset, King Salman and Crown Prince Muqrin will receive pledges of allegiance from other ruling family members, Wahhabi clerics, tribal chiefs, leading businessmen and other Saudi subjects. In the kingdom's strict Wahhabi sect of Sunni Islam, ostentatious displays of grief are frowned upon, although there was an immediate surge of sorrowful messages from Saudis on social media.